The ability to tell stories needs to be trained in early childhood to learn to express their thoughts, needs, and emotions. The purpose of the study was to analyze the initial ability of storytelling that is owned by children aged 5-6 years so that it can be taken into consideration in determining the learning media to be made. 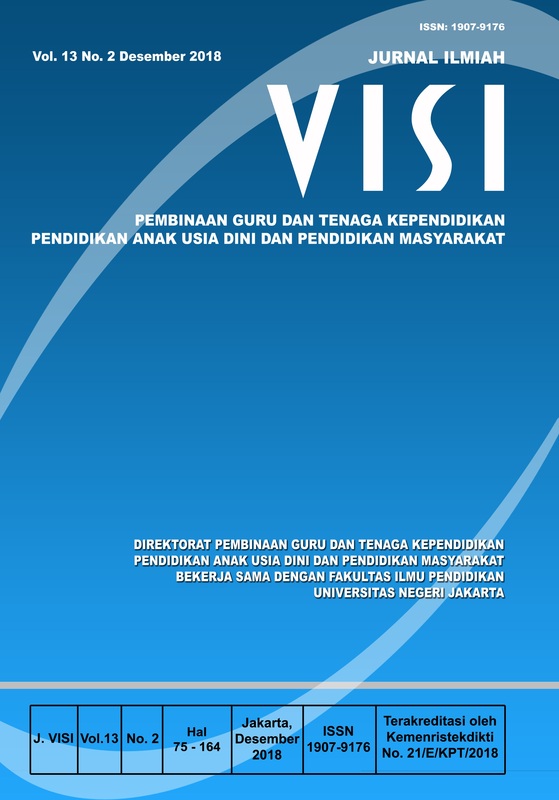 The place of the study was conducted at Al Iman Kindergarten in East Jakarta from January - December 2016. The research method used was quantitative by using a storytelling ability test that was distinguished by language and non-language aspects. Data analysis techniques are carried out using descriptive statistics. The results of the research are indicators of storytelling abilities derived from language and non-language aspects. Based on the results of the storytelling ability test obtained if most children are still not good in the language and non-language aspects. Recommendations for further research are expected to develop learning media that train children’s storytelling skills for the better. Djaali & Muljono, (2008). Pengukuran dalam bidang pendidikan. Jakarta: Grasindo. Fekonja-Peklaj, U., Marjanovič-Umek, L., & Kranjc, S. (2010). Children’s storytelling: The effect of preschool and family environment. European Early Childhood Education Research Journal, 18(1), 55–73. Maidar G. A. & Mukti U.S. (1988). Pembinaan kemampuan berbicara. Jakarta: Erlangga. Nurgiyantoro, B. (2010). Penilaian pembelajaran bahasa berbasis kompetensi. Yogyakarta: BPFE. Willis, C. A., & Schiller, P. (2011). Preschoolers’ social skills steer life success. YC young children, 66(1), 42-49. CCCNS NoG-090-Wil/YC.